Looking and Cooking, Earning and Learning! A delighted Zukie joins DreamTeam member Mel, in a true “Link of Love”! It has been our delight to assist a large number of candidates to join the Feedem Pitseng Learnership programme. One such candidate is Zukiswa (Zukie) Kaspile who grabbed the opportunity to “Learn and Earn” with both hands. “I have always loved learning new skills and have taken up plenty of short term opportunities recently. While I have been unable to gain full time employment, I have used the time to learn more.That is how I gained my code 8 drivers licence and did some basic computer and office admin courses too. I really love cooking, so this opportunity to do a one year learnership in this field was so exciting for me” she explains. 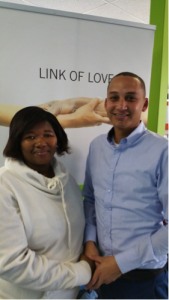 Employer, Elmarie Louw was delighted with the service she received from DreamWorker, while recruiting her new candidates. (Zukiswa and her colleagues will be taken on for a 12 month learnership, with a monthly stipend to cover daily travel and expenses. The learnership will result in an NQF level 4 qualification. 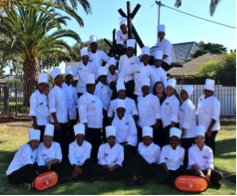 Candidates will gain theoretical knowledge and practical experience and should they succeed with their assignments and assessments, will achieve a certificate in Professional Cookery by CATHSSETA. 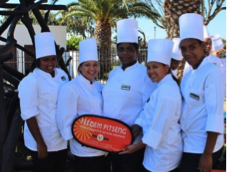 Feedem Pitseng has been operating since 1975 and is very proud to be able to offer these opportunities to the youth of South Africa, affording them the chance to upskill themselves. 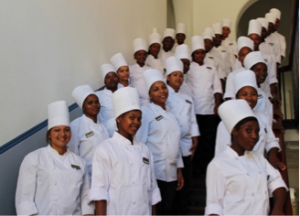 Learners work daily in a wide range of institutions, from Parliament to hospitals, corporate catering to event functions).